We've written before how crowdfunding is particularly powerful in niches where there are both strong ties between industry players and inefficiencies in the market. That's certainly true of real estate, where the fundraising process has numerous layers, each with their hand in the cookie jar, taking fees. Enter real estate crowdfunding. Standing in between a property and an end investor are investment advisors, pension funds, private funds, and real estate brokers. Each one charges fees. The more layers in these transactions, the less transparency there is in the entire fundraising/investing process. 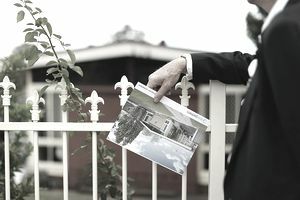 Crowdfunding makes it super easy for a property owner or developer to go straight to the end investor and that's what real estate crowdfunding is all about. Fundrise is a leader in the real estate crowdfunding space and one of our 2015 crowdfunding sites to watch. As urban retail developers, we spent years building unique real estate projects in Washington, DC. But more often than not, when we went out to raise money it came from investment funds in places like New York City or even outside the country. Most of them had little connection to the places we were building and often had never even heard of the neighborhood. For the Millers, it's about giving everyone -- particularly, local investors -- the opportunity to invest in real estate. If you were worried about being a small time investor, there’s some good news for you... own a stake in Lower Manhattan’s 3 World Trade Center. With Fundrise, investors can access real estate investments in some of the top US markets with minimum investments of just $5000. That's because Fundrise is a marketplace of investment opportunities. The Fundrise team susses through hundreds of opportunities every month and after a due diligence process decides to underwrite the top 5% of real estate deals it sees. Once that underwriting decision is made, investors on the crowdfunding platform can research an opportunity and decide to invest alongside the crowd. Fundrise works with leading real estate firms to ensure investors get opportunities to invest in high profile properties, like 3 World Trade Center (the 3rd tallest building in the future World Trade Center). Part of the power in Fundrise's model is that the firm's own investors reads like a list of the who's who of real estate investors globally. Top executives at firms like Silverstein Properties (World Trade Center), Ackman Ziff, Loopnet, Renren, Rising Realty Properties, and Western Development have all bet on Fundrise to spearhead the excitement of real estate crowdfunding. The company claims it had over 40,000 investors signed up on its platform as of February 2015. What's interesting is that unlike investing in a fund, where it's hard to get your money back other than in the form of monthly or quarterly dividends, an investor can use Fundrise to create a diversified portfolio of real estate that is designed for periodic liquidity every 1-3 years. An investor can take that money out or plough it right back into a new investment.